For Barcelona Activist Turned Mayor, The Anti-Corruption Goals Stay The Same : Parallels Ada Colau is a former Occupy activist, once arrested for blocking home evictions during Spain's economic crisis. Now she's Barcelona's mayor, a job in which, she says, "you're closest to the people." Ada Colau, center, celebrates after her election as Barcelona's mayor in 2015. At the height of Spain's economic crisis a few years ago, protesters used to form human chains around houses to prevent authorities from serving eviction papers to homeowners who'd fallen behind on their mortgages. Often at the center of the crowd, with a megaphone, was Ada Colau. She was an Occupy activist who founded an anti-eviction group, organized protests in front of thousands of homes and banks and got hauled away many times by police. She was evicted from Spain's parliament in February 2013, when she interrupted a debate on banking laws with shouts of "Si, se puede!" — Yes, we can! — from the gallery. "It was very powerful. She had collected all these signatures to change the law, and she was yelling from the gallery and protesting," says Liz Castro, a longtime Barcelona resident and Catalan independence activist who respects Colau, even as she opposes her. "I found her very brave, making change happen, and motivating all these other people. I was impressed." Ada Colau was carried out by riot police officers after occupying a bank in Barcelona in July 2013. Two years later, she was elected the city's mayor. Colau had become such a folk hero that she was invited back to the parliament later the same month to testify on Spain's economic crisis. Before she took the microphone, a spokesman for the Spanish bankers' association told the lawmakers that bankers played no role in the economic collapse — even though they did, and had to get a bailout from Europe. When it was Colau's turn to speak, her voice was shaking, but she minced no words. "This man is a criminal, and should be treated as such! He's no expert. Bankers are the ones who got us into this mess," she said. "It's these very people [who] ruined the economy of this country. Yet you still refer to them as experts!" She was scolded for her language and was asked to apologize, but she shook her head and refused. 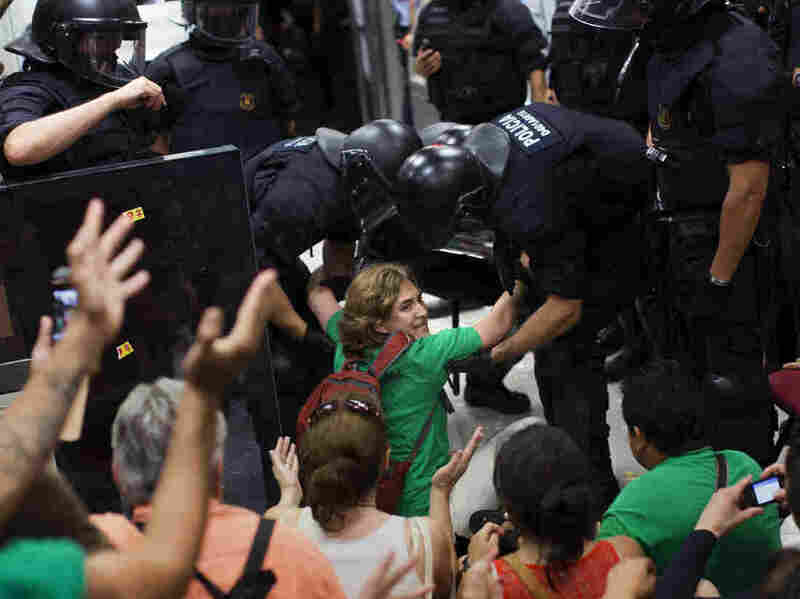 Now, four years after that confrontation, Colau is a politician herself — Barcelona's first female mayor — and the boss of the police who once handcuffed her. She was elected in May 2015 on a wave of anti-establishment anger fueled by Spain's economic crisis. Even though Colau, 42, has made the transition from grassroots activist to politician in charge, she says she feels like the exact same person with the same goals: to fight corruption, make government institutions more transparent and solve real problems. She's just got a different role now, she says. In an interview at her office at City Hall, Colau recalls how she felt at that 2013 parliamentary hearing. She says she hadn't planned to be confrontational. "My reaction was simply to say what I thought. Every day, I was with people who were losing everything, and this guy had no idea what was happening in our country!" she says, laughing. "So I spoke plainly, in a tone that you don't hear often in parliament." Since taking office, Colau has quadrupled public spending on social housing and fined mortgage lenders that kept foreclosed homes empty. She's banned new hotels in Barcelona's city center, which she says risks becoming a souvenir theme park, overrun by tourists. She also slashed her own salary and refused a government-issued Audi. She rides the metro to work instead. Colau's latest target is President Donald Trump. After Spain's conservative prime minister held a friendly phone call with Trump, Colau launched a social media campaign with the hashtag #NoenNuestroNombre — "not in our name." "He questions human rights and says sexist and racist things," she says. "You have to put limits on diplomacy with someone like that." In January, Colau joined an anti-Trump women's march in Barcelona, and says more are in the works. There's some irony here: Those who study local democracy say even though Colau's supporters and Trump's may be on the opposite sides of the political spectrum, there are similarities. They're people who've felt under-represented in politics, left out by elites — motivated by some of the same inequalities and fears that led Britons to vote to leave the European Union. "They all feed off a similar hunger for what in Spain we've called 'real democracy,' and what in the U.K. has been called 'take back control' — this idea of popular sovereignty," says Kate Shea Baird, a British-born, Barcelona-based local democracy activist who has worked with Colau. "I think it shows that [a] kind of frustration and the economic crisis can [both] be channeled into positive projects — or nationalist, authoritarian projects. So it can go either way." As for the future, Colau denies having any ambition for higher office, though she's more popular than many national politicians in Spain. 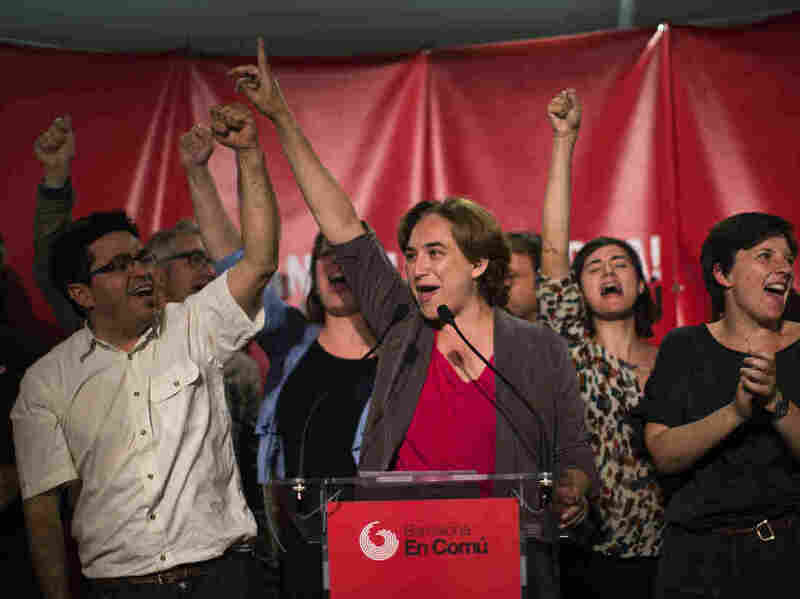 Her opponents include those on the right who oppose increased public spending, and some on the left, including Catalan independence activists like Castro. They want to break away from Spain and form a new country with Barcelona as its capital, and they're angry Colau has prioritized municipal projects rather than nationalist ones. "People think being a mayor is like being on the lowest rung on the ladder of politics, and that you always want to move up," Colau says. "But I disagree. Being a mayor is where you're closest to the people." If she were to imagine a movie about her life, Colau says the major scenes would be that 2013 parliamentary hearing when she called bankers "criminals," the day in 2015 when she was elected as Barcelona's first female mayor — and the day she became a mother. This spring, she will give birth to her second child. After that, she says, it's back to work.